Ah, the classic bright yellow ork vehicle. There's something so pure and special about this. The color choices harken back to the 90s, when everything was bold and in your face, but with a modern twist. The conversion work on this is pretty subtle, but definitely adds to the overall feeling and story of the piece. I'm pretty positive that claw is from some ork nob or something, but I could be wrong. 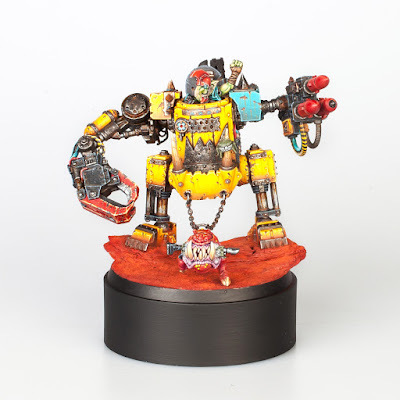 My favorite additions though are the moon helmet on the grot, and the squig chained to the front of it. 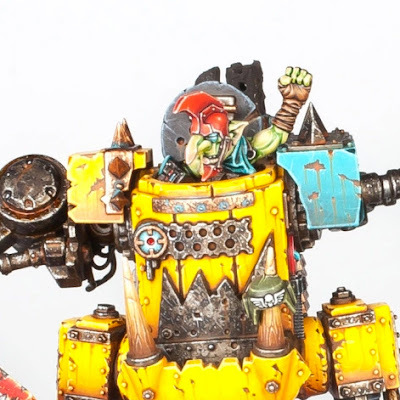 The moon helmet is a great nod to the Bad Moonz clan, which this dred is a part of with it's bright yellow paint, and adds a ton of character to the diminutive pilot. With the squig, I'm not sure if it's pulling the dred along, or just chained to the front, but I really like it. It appears to be from the Nightvault warband, with the bone in its mouth swapped out for a lasgun to tie it more firmly into the 41st millennium. The colors on this thing are bananas (pun intended). They're so bright and in your face, from the yellow, to the teal, to the blazingly saturated red earth its standing on. The whole thing just demands your attention. It's all painted expertly as well, with smooth blending and crisp highlights. The amount of weathering on this is ace as well. It's just enough to make it feel orky and tie it into the base, but not so much as too distract from the colors used. I like that the only things that aren't retina burningly bright are the organic parts, like the grot and the squig. Everything about this is just so orky its perfect.